I had the privilege to spend time in beautiful Cape Town filming the new series of my online wine show ‘The Grape Press’, celebrating the unique wine and dine experience that can only be found in the Winelands of South Africa. As part of the famed Readers’ Choice Awards survey, Conde Nast Traveler’s readers just named Cape Town the best food city in the world! Arriving at Creation Wine Estate was like entering a lush oasis with the most vibrant helianthus blooms welcoming me at the gate. The extreme contrast, from the surrounding parched patchwork countryside, gave the estate an ethereal hue, reflecting the true nature of the Hemel-en –Aarde ridge, which in Afrikaans means heaven and earth. Everything about this place is perfect from the name to the décor to the wine and how it is paired with incredible cuisine. Creation is immaculate in every way and I can honestly say the experience certainly lived to the estate’s award-winning reputation. I had the privilege of tasting the wines of Creation with the Swiss-born owner and winemaker Jean-Claude Martin. JC and his wife Carolyn took on the challenge of establishing a model wine farm in the remote Walker Bay region in 2002. Since then they have gone on to create a little piece of paradise with their flourishing vines in a unique terroir. A perfect combination of 450 million year old clay loam soils derived from decomposed Bokkevled Shale, cooling winds from the Atlantic and generous sunshine produce grapes of outstanding quality. Temperatures on the lofty ridge barely exceeds 30°C during the growing season and the cool night index being 12°C lower than the daytime temperature allows the creation of beautifully complex wines. The grapes ripen in optimum soil pH levels and acidity allowing Creation to hold fast to its philosophy that the less you interfere with nature the better the result in the wines produced. This is one the Creation's flagship wines made from only the best grapes from a single site in a single vineyard. In addition, it is a barrel selection wine and only produced when the winemaker is satisfied that it has made the grade and the yield is exactly right. It really is quite special in its character and you can really taste its purity with delicate quince and lime on the nose. The Art of Chardonnay is wonderfully fresh, and although aged in oak barrels for 10 months, its woodiness is beautifully integrated, never overpowering the vanilla, pear skins and subtle citrus notes on the pallet. This is the pièce de résistance of the Creation wines. This is an award-winning wine and one of only 4 wines to receive the prestigious 5-star rating from the 2018 Platter’s Guide. It has a stunning deep pomegranate-seed red colour with a robust nose of rose petals, black cherry, and anise. The Art of Pinot Noir is an intense and complex wine on the palate, with layers of cherry and plumb mingling with earthy mushroom flavours and a hint of spice. Jean-Claude firmly believes that the Pinot Noir made here is one of only a few places in the world where the wine is ‘strong and structured, but always remaining elegant and full of finesse. Pinot noir is notoriously a fickle grape and is a real challenge. Other varieties you can tweak but with Pinot Noir, you have to pick at the right time and be extremely precise all the way through the winemaking process’. This Pinot Noir is an incredibly stylish wine and fantastic food companion. Served chilled it’s great at lunchtime in the summer too. Carolyn Martin takes the food and wine pairing at Creation to another level. The experience is a mind-blowing flavor sensation and the culinary innovation and imagination is nothing short of genius. I was floored at the get-go by Carolyn’s delicious pinot noir sourdough rolls that pay homage to the land, specifically made to resemble the 450 million-year-old Bokkeveld shale foundations of the region’s terroir. The light and creamy goats milk cheese and whipped sour cream spread to atop the rolls compliments the velvet texture of estate’s signature pinot noir perfectly. Adding yet more layers of imagination and complexity is the vineyards home-made red wine-salt delicately sprinkled on top of the heavenly butter substitute. It is all about the wine here and it flows through everything at creation, including the bread rolls! Breaking them open reveals a beautiful purple colour from the wine and as if it couldn’t get any better, you can actually taste the pinot noir in the bread too. The passion for food and wine at Creation is overwhelming and their philosophy that wine can be consumed at more or less any time of the day has inspired the ingenious pinot noir brunch pairing menu. Anywhere that condones red wine for breakfast is my kind of place. Creation offers a 5 course 10 am brunch pairing, and I got to taste one of these incredible dishes, which took me completely by surprise. Alongside smoked roasted duck breast, Carolyn cleverly incorporates the essence of pinot noir with it’s exquisite layers of red berry fruit, cherry and notes of rose petals with fresh raspberry and crushed freeze-dried raspberry to provide a super intense flavor and natural acidity perfectly mirrored in the Art of Pinot Noir. Brioche French toast with maple syrup brings out a hint of sweetness and with dried king oyster mushroom, the sprinkling of chives and wild garlic flowers, there is no better way to start the day. This beautiful Duck brunch dish is referred to as a horizontal pairing with the wine. This means it is a marriage of flavours and seeks to build layers of intensity, encouraging the integration of flavours through similar tastes, textures, colour and even aromas. Vertical pairings use contrast to highlight flavours and textures and the way they interact. The paring of the goat's milk cheese spread and Pinot Noir bread rolls is a good example of this with the contrast of the wine cutting through the creaminess of the goat's milk cheese. The Creation vineyard is all about the love affair with wine and food and the next pairing I experienced was literally a match made in heaven. The marriage of an orange saffron mousse ring, roasted coconut flakes and sweet prawn meat with the exquisite Art of Chardonnay is the stuff fairytales are made of. With apricot notes and stone fruit coming through, I thought I actually heard the angels singing. Adorned with gorgeous snapdragon flowers the romance of this divine pairing was certainly in full bloom. The complexity of this innovative dish is beautifully mirrored in the complexity of this Queen of white wines. This was a fabulously unique paring all about weight and texture profiling, and balance. The full kiss and tell tasting at Creation is a 6-course pairing (3 different Chardonnay pairings and 3 Pinot Noir pairings) menu, brilliantly illustrating the versatility Creation’s wines with their incredible cuisine. Game is a very important part of South African cuisine and nothing goes better with Creation’s Art of Pinot Noir than Springbok. It has a very delicate flavour with a little hint of sweetness. Garnished with violets this rich and earthy dish is the perfect pairing with the vineyards flagship wine. Joseph Stefano is one of South Africa’s most celebrated sommeliers, and this is his favourite food and wine pairing of all time. 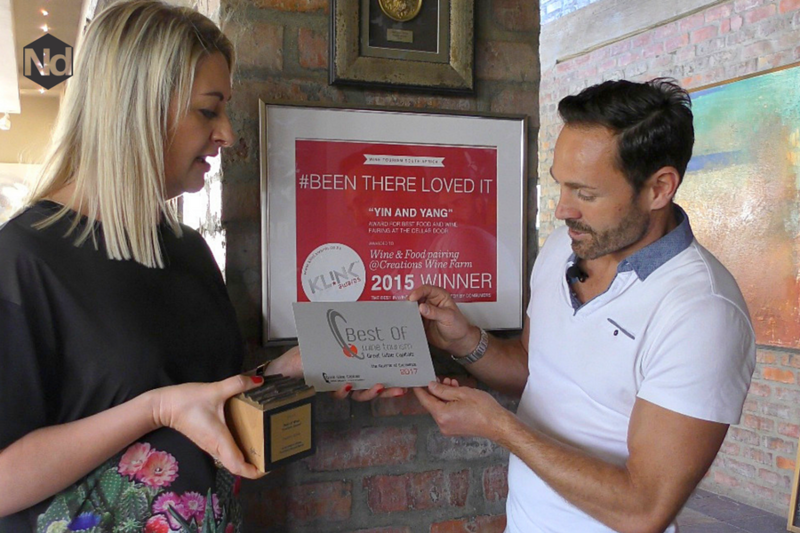 Creation has won the Klink Wine Tourism Award for Best Food and Wine Pairing 4 years running. The wonderful thing about the Klink awards is that it’s judged by the people who visit Creation - and the people have spoken. With over 70,000 visitors a year, Creation is also the proud recipient of the Best of Wine Tourism Award, winning the innovation award many times over. All Creation wines all have the integrity and sustainability seal and every bottle has it’s own unique number so you can check the whole of the farming process from beginning to end, until it reaches the table. Creation is also a member of the Biodiversity and Wine initiative and is committed to serving their natural heritage by implementing long-term bio-diversity as well as sustainability programmes. Creation is one of those places that makes life in this world a little bit better. The quality of ingredients reflects the quality of the grapes that are used in the winemaking process. It is culturally exciting, culinarily exhilarating and run by people whose passion is evident with every interaction. Creation in my opinion should become a landmark for South Africa.